the advantages offered by the Cisco WLAN infrastructure. Skorpio X3™ mobile computers also include Datalogic’s patented ‘Green Spot’ technology for good-read feedback. This technology projects a green spot directly on the bar code, notifying the user that a successful ‘read’ has occurred. 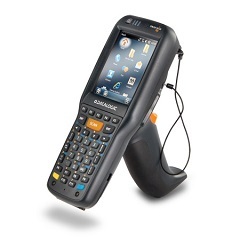 Both 1D laser scanning and 2D bar code imaging configurations provide an inclined scan engine so that the display can be viewed while reading bar codes. There is no need for the user to turn the wrist in order to scan, thus making it easier to aim andfaster to read.